Draft: 2006, St. Louis Cardinals, 8th rd. Allen Thomas Craig…married his wife, Marie, two weeks after Game 7 of the 2011 World Series...the couple has a daughter, Eden...his hometown of Temecula, CA celebrated "Allen Craig Day" on 1/10/11 following the 2011 World Series win...attended the University of California at Berkeley...was named to the Academic First Team All-Pac 10 Team...graduated from Chaparral High School in Temecula, CA in 2002, where he played both baseball and basketball...played for the 2002 USA Junior National Team in Canada... originally signed by St. Louis Cardinals scout Dane Walker. Spent the entire campaign with El Paso (AAA), hitting .293 (93-for-317) with 18 doubles, 13 HR, 59 RBI and 52 runs scored across 92 games ...Opened the season hitting a .248 (29-for-117) between April and May...went on to hit .320 (64-for-200) from 6/1 through 9/2...Recorded a professional career-high five hits on 7/25 at Colorado Springs, going 5-for-5 at the dish with two HR and five RBI and finishing a triple shy of the cycle...the five RBI matched his career high for the fifth time and second of the season (also: 7/6)...had not had a five-RBI game since April 2012...Hit .305 (50-for-164) with 10 doubles and four HR at home as opposed to a .281 clip (43-for-153) with nine HR and eight doubles on the road...Appeared in 92 games and made 63 starts at 1B and seven in LF...Started in all five of the Chihuahuas postseason games (two at 1B, three as DH) and hit safely in four contests, batting .250 (4-for-16) at the dish with one double, one HR, three RBI, five BB and four runs scored. Spent the entire season in Pawtucket (AAA) and slashed .253/.352/.316 in 47 games played...Made 14 appearances at first base, 26 as a designated hitter, three in right field and two in left...did not make an error in 109 total chances...His eight extra-base hits were the most he had since 2015 with Pawtucket...logged seven doubles, one home run, 14 RBI, 18 runs scored and 22 walks. Missed a majority of the season due to a pair of DL stints with Triple-A Pawtucket. Played in only 4 games with the PawSox before landing on the DL with a left oblique strain from 4/14- 5/15...Reinstated on 5/16 but appeared in only 2 games before returning to the DL with right knee inflammation from 5/21-8/12...Went 2-for-2 with a HR and a BB on 5/19 at Buffalo. Appeared in 7 rehab games with Short-A Lowell from 7/28-8/11...Reinstated on 8/13 and played in 16 more games with the PawSox. Made 15 starts and played in 36 games over two stints with BOS...spent the majority of the season with Pawtucket (AAA), ranking third in the International League in OBP (.368)...Made his first Opening Day roster with BOS...split time defensively between right field (nine games, five starts), left field (seven games, four starts), and first base (six games, three starts)...also made three starts as a designated hitter...Made his season debut on 4/6 at PHI, recording a pinch-hit single and scoring a run in Boston's Opening Day victory...Hit his only homer of the season on 5/1 vs. NYY, breaking a 1-1 tie in the fourth inning and snapping a homerless stretch of 106 at-bats...recorded his 500th career hit on 5/4 vs. TB, a sixth inning single...Optioned to Pawtucket following 5/9 at TOR...outrighted to Pawtucket on 5/18...Played 93 games (all starts) with the PawSox, appearing defensively at first base (46 games), DH (24 games), right field (21 games) and left field (2 games)...posted a .993 fielding percentage at first base (three errors in 427 total chances) and did not commit an error as an outfielder...Ranked among Pawtucket leaders in hits (2nd, 94), doubles (2nd, 14), walks (2nd, 49) and RBI (T-3rd, 30)...Selected to the ML roster from Pawtucket on 9/1. Hit .215 (99-for-461) with 20 2B, 1 3B, 8 HR, and 46 RBI in 126 games between the Cardinals and Red Sox...Acquired by BOS at non-waiver trade deadline...Defensively between the 2 clubs, appeared at RF (82 G, 78 GS), 1B (41 G, 37 GS), and LF (11 G, 3 GS)...Was 1 of only 3 players in MLB to play at least 1,000 defensive innings without committing an error (also BAL's Nick Markakis and TB's Desmond Jennings)...Began the season with 97 games for STL, hitting .237 (87-for-367)...Batted .270 (48-for-178) with 11 2B, 1 3B, 5 HR, and 28 RBI in 47 games at Busch Stadium compared to .180 (51-for-283) with 9 2B, 3 HR, 18 RBI in 79 games on the road...Posted a .291 AVG (30-for-103) with 8 XBH (5 2B, 3 HR), 19 RBI, and a .354 OBP in May for the Cardinals...Had a season-long 12-game on-base streak from 5/21-6/1 (.370, 17-for-46, 5 BB, .453 OBP)...Hit .337 (34-for-101), 7 2B, 2 HR, 19 RBI over a 25-game stretch from 5/21-6/16...Ranked T-2nd in the NL in hits and T-3rd in RBI over that span...Acquired by the Red Sox on 7/31 with RHP Joe Kelly in exchange for RHP John Lackey, minor league LHP Corey Littrell, and cash considerations...Added to the active ML roster on 8/1 and made Sox debut that night vs. NYY, starting in LF (1-for-4, 2B). 4 of his 12 hits with the Red Sox went for extra bases (3 2B, HR)...Went 2-for-4 with a double for BOS as a pinch-hitter...Placed on the 15-day DL on 8/5 (retro to 8/2) with a left foot sprain...Played in 2 games on rehab for Triple-A Pawtucket and activated on 8/21...Launched 1st HR as a member of the Red Sox on 8/26 at TOR, a 2-run shot in the 11th inning...It accounted for his only RBI with the club...Marked his 1st career extra-inning home run...Reached base safely in 5 of his last 6 games to finish the season, 9/20-28. Began the season on the Opening Day roster as the starting first baseman... Was a manager's selection to the National League All-Star team. Made a pinch-hit appearance against Mariano Rivera in the 8th inning and lined out to LF... Led the majors with a .454 batting average (59-130) with runners in scoring position while ranking T3rd in MLB with 83 RBI w/RISP. The .454 BA w/RISP trails only George Brett (.469, 1980) and Tony Gwynn (.459, 1997) since 1974... Posted a career high 97 RBI and ranked 3rd in N.L. with an RBI every 5.24 AB. Also set single-season highs in hits (160), games (134) and triples (2)... Ranked among the National League leaders in RBI (97, 8th), batting (.315, 8th), on-base percentage (.373, 11th), multi-hit games (47, T15th), three-hit games (12, T14th) and hit by pitch (10, T11th)... Batted .336 at home, 7th among all Major Leaguers... Ranked T7th in N.L. with 25 go-ahead RBI and T12th with 12 game-winning RBI. Ranked T2nd in the N.L. (T5th in MLB) with 45 two-out RBI... Had an RBI in 64-of-134 games, 38 multi-RBI games. Cardinals were 48-16 in games during which Craig recorded an RBI... Posted a season-high hitting streak of 12 games (5/27-6/8) and also recorded three nine-game streaks. Did not go more than two games without a hit from Opening Day through July 24. His 37 hits in May tied his single-month high (Aug. 2012)... Knocked in 26 runs during June, 2nd in the N.L., his career high for RBI in a month... Tied his career-high with four-hit games on 6/25 at HOU and 7/14 at CHI... Hit his first career MLB grand slam (50th career HR) vs. CIN (8/26) giving the Cardinals an 8-5 lead and eventual win, and tied his career single-game high with 4 RBI... Missed final 22 games of the season and the Division Series and League Championship Series with a left foot sprain, suffered in the 3rd inning at CIN (9/4) while turning at first base on an infield single... Added to the World Series roster after missing the DS & LCS recovering from a foot injury and hit .375...singled as the DH in Game 1 at Boston; had BB and single in Game 2...had PH double in the 9th of WS Game 3 and scored the winning run in the 9th after a defensive interference call at 3rd base awarded him home in the 5-4 walk-off victory...had PH single off the bench in the 9th of Game 4...started at first in Game 5 (0-3) and singled twice as the DH in Game 6. A key contributor in the Cardinals lineup, Craig batted fourth most of the season. Made 86 starts at 1B, 21 in RFand 5 in LF. Led MLB players in batting with RISP (.400, 50-125, 8 HRs and 74 RBI). Finished the season with 92 RBI in 119 games. Ranked 6th among National League leaders in BA(.307) and 5th in SLG(.522); also in HR (22, T28th), RBI (92, T15th), doubles (35, T18th)& OBP (.354-20th). Posted a .512 BA(21-41) on the 1st pitch with 2 HR's,ranking 6th in the N.L. His 17 go-ahead RBI were 3rd among Cardinals players; had eight game-winning RBI for STL. Started the season on the disabled list recovering from off-season knee surgery (fractured right knee cap) and was activated on 5/1 after missing 22 games. Appeared in 13 games and went 19-51 (.373) with 5 HRs and 19 RBI before landing on the D.L. a second time 5/18 (retroactive to 5/17) with a left hamstring strain. Was activated from the DL on 6/1 after missing 14 games. Had two multi HR games: 7/2 vs. COL and 8/7 vs. SF. Had two doubles in 7th inning on 7/22 vs. CHI; the first Cardinal since Jerry Mumphrey (5/30/77)to have two 2Bs in an inning.Was on base all five times 7/31 at COL with three singles, two walks and 3 RBI. Had a career high 13-game hit streak from 8/10-24 (23-53, .434); also had a 10-game hit streak 9/7-16 (13-44, .295). Finished August T3rd in the N.L. in hits (37), and T2nd in doubles (10)&runs (22). Had his first career walk-off hit with an RBI single in the 10th vs. MIL on 9/9. Set a personal monthly high with 20 RBI in Sept.,ranked 2nd in N.L. with 28 singles and 7 go-ahead RBI for the month. Singled in all 4 PAs 9/28 vs. WSH (ties his career high). Had 45 multi-hit games on the season (T21st in the League), 12 3-hit games (T15th). 2012 POSTSEASON: Had two hits at Atlanta and drove in the Cardinals first run of the Wild Card game ... had 1B, 2B and HR in Division Series Game 2 win in STL vs. Washington... put the Cards on the board with RBI-2B in the 1st in Game 3 and had two of team's three hits in Game 4...hit .316 with six hits, four walks and 3 RBI overall during the DS...played in all 7 League Championship games vs.San Francisco...played RF in Gm 4, LF in Gm 6 and 1B in his other starts....had a hit in LCS Games 4-6, and drove in STL's only run with a single in Game 6. Hit .315 in a season in which he made 47 starts, appearing in 75 games. Hit .327 down the stretch in September. collecting five of his 11 HR's during the month. ... Spent the entire season with St. Louis, although he missed periods of time while on the disabled list. ... Made starts at 2B, 3B, LF, CF & RF. Also made one appearance at first. Was flawless in 103 total chances with one "outfield" assist, which came while playing in a five-man infield at SF (4/8) in the 11th inning. ... Was on the 15-day DL from 4/18-5/1 with a strained left groin. Played two games at Springfield (AA) on a rehab assignment. ... Missed 54 games from 6/8-8/9 with a fractured right knee cap suffered during a collision with the wall/railing in Houston (6/7). ... Appeared in 10 games at Memphis (AAA) during his rehab, going 10-35 with a double, triple, home run and five RBI. ... Tied for the team lead (Hamilton) with seven pinch hits (7-22, .333). Ranked 2nd on the club with four pinch RBI. ... Had the second most home runs (11) in the National League for a player with 200 at-bats or less. ... Drilled a two-run home run off San Francisco's Tim Lincecum 6/1 for his first career pinch homer. ... Had two multi-homer games. His first coming at PIT (8/17) and the second at PHI (9/18). ... Set a career high with four hits to go with his two home runs and three RBI on 8/17 at PIT. ... His first career CF start came on 8/19 at CHI after returning from the disabled list. ... Homered twice with a double for 10 total bases, three RBI & three runs scored on 9/18 at PHI. ... Underwent right knee surgery in the off-season, performed by Dr. Richard Steadman at the Steadman Clinic in Vail, Colo.2011 POSTSEASON: Appeared in 15 postseason games, including all seven games of the World Series ... hit four home runs in the postseason (T5th all-time STL) and three in the World Series tying Albert Pujols (2011) for the franchise record ... Cardinals won all threeWorld Series games in which Craig homered ... his three game-winning RBI in aWorld Series tied the MLB record (Kiki Cuyler,PIT, 1925 & Hank Greenberg, DET, 1945) and the Cardinals franchise record for a postseason, and also T8th all-time for a single postseason series ... had four go-ahead RBI in theWorld Series which set a Cardinals franchise record and T2nd all-time behind Gene Tenace (A's, 6, 1972) and tied with Lou Gehrig (1928, NYY) and Josh Hamilton (2011, TEX) ... four go-ahead RBI in the postseasontied Lance Berkman for the most by a Cardinal (also 2011 postseason) and T2nd most in one postseason (Albert Pujols, 5, 2004) ... recorded an RBI in each of his first three World Series at-bats, becoming the first player since Ted Kluszewski with the White Sox in 1959 ... recorded a hit in three consecutive pinch-hit at-bats in the postseason (Game 6 NLCS, Game 1 WS, Game 2 WS), T2nd most all-time in postseason history (18th time) ... recorded a pinch-hit RBI in three consecutive games, tying a postseason record (Dusty Rhodes, Del Unser, Hal McRae) ... had never hit a triple in 314 career MLB at bats, but hit one in Game 2 of the NLDS and scored the winning run ... hit solo home run in Game 4 of NLCS and had a two-RBI pinch-hit single in Game 6 ... recorded pinch-hit, goahead singles in both Game 1 and Game 2 of World Series, both off Rangers' Alexi Ogando ... started in right field in Game 3 of WS and hit a solo HR in his 1st at-bat ... came off the bench (Holliday injury) to play left field in Game 6 of the World Series and hit a solohome run off Derek Holland (Holland's first runs allowed in the World Series after 10 consecutive scoreless innings) in the bottom of the eighth inning ... started in place of the injured Matt Holliday in Game 7 and hit the go-ahead/game-winning solo home run off Matt Harrison in the third inning on a full count, and later robbed Nelson Cruz of a home run in the top of the 6th inning ... caught the final out of World Series Game 7 hauling in David Murphy's fly ball at the left field warning track. Started the season on the Major League roster and appeared in 44 games...Made eight straight starts from 9/24-10/2 batting .393 with 2 HR and 6 RBI...Struggled in April batting .056, but was recalled four more times and finished strong batting .382 in Sept./October...Batted .382 (13-34) after Sept. 18 recall, including slugging .647 with 2 HR & 6 RBI...Hit safely in 8 of final 12 games with four multi-hit games...Recorded first ML hit at MIL (4/11) off Carlos Villanueva and first ML home run off Kyle Kendrick (7/19 vs. PHI) as part of a Cardinals 3 HR inning...Batted .300 (18-60) against NL Central opponents with 2 HR and 18 RBI...Had three game-winning RBI, most among Cardinals rookies...Played in 83 games at Memphis (AAA), batting .306 w/ 14 HR & team leading 81 RBI...Hit .389 with runners in scoring position at MEM and hit his first professional grand slam (7/5 at RR) off Yorman Bazardo...His 35 RBI in June for Memphis was tied for the highest monthy total by any minor leaguer at any level in 2010...Was only player on Cardinals Opening Day roster without prior ML time...Rated as the No. 5 prospect in the Cardinals organization by Baseball America...Rated as "Best Power Hitter" in the Cardinals organization in "Best Tools" by Baseball America. Named Cardinals Minor League Player-of-the-Year after batting .322 with an organization best 26 home runs and 83 RBI atMemphis (AAA). Also led the Cardinals minor leaguers in hits (152), runs (78) and tied for slugging (.547)...Ranked fourth in the Pacific Coast League in batting, home runs, hits and third in total bases (258)...Has batted over .300 with at least 75 runs, 130 hits, 25 doubles, 20 home runs and 75 RBI at every full-season level...Registered hits in 40 of his last 49 games (76-for-189), batting .402 with 17 home runs and 47 RBI...Honored as the Cardinals Minor League Player-of-the-Month for July after batting .392 with 10 home runs and 26 RBI...Led Memphis squad in eight offensive categories (batting, hits, runs, home runs, RBI, doubles, on base pct. and slugging)...Compiled 48 multi-hit games and 20 multi-RBI games...Missed 14 games from 6/25 to 7/6 with a sprained left ankle...Homered in three consecutive games at Albuquerque (8/27-29)...Part of six of the seven back-to-back or consecutive home run combos for Memphis...Hit two-out, pinch-hit, game-tying single in the ninth inning then came around to score the go-ahead run at Albuquerque in Game 2 of PCL playoffs...Went 2-for-5 with a home run and two RBI in AAA Championship Game against Durham...Listed as the 7th-best prospect and best power-hitter in the Cardinals organization by Baseball America. Spent his entire season with Springfield (AA) as the everydaythird baseman (108 games). Also played 17 games in left fieldand two at first base...his .941 fielding percentage led TexasLeague third basemen as did his 217 assists...named to theTexas League All-Star squad and was the starting third basemanfor the North Squad...went 0-2 in the 7-4 extra-inning loss...tabbedas a Texas League postseason All-Star...his 154 hits pacedCardinals farm hands and ranked 3rd-most in the Texas League,as did his 250 total bases...hit 22 home runs which ranked 5th inthe League. His .304 batting average was 9th best among TexasLeague hitters...batted over .300 three months of the season,including a high of .369 (45-122) in July with eight home runs and21 RBI...put together a 15-game hitting streak from 6/22-7/11 inwhich he had eight multi-hit games and batted .381 (24-63). Selected as the Cardinals Minor League Player of theMonth for June after batting .337 (33-98) with 19 runs, seven homeruns and 24 RBI in 26 games...named the Most Valuable Playerin the Florida State League All-Star game after going 2-4 with a 2-run HR in the 5th inning of the 8-4 win by the East squad...participated in the FSL All-Star Game Home Run Derby, finishingthird after falling in a tie-breaker to Palm Beach teammate MarkHamilton...his 224 total bases were second-most in theFSL...finished third in the FSL with a .312 batting average, 21 HRsand a .530 slugging percentage...ranked 5th in the League with77 RBI...was named to the FSL postseason All-Star team. Began his professional career at Class-A State Collegeplaying mostly at third (35 games)...also appeared in three gamesat shortstop and one at second base...strung together a 14-gamehitting streak from 7/14-31 (19-52, .365)...hit .316 during themonth of July...with runners on and two outs was a .297 hitter andhit .298 with runners in scoring position. March 19, 2019 El Paso Chihuahuas released 1B Allen Craig. 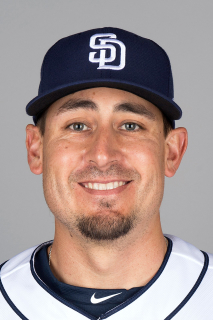 March 19, 2019 San Diego Padres released 1B Allen Craig. December 21, 2018 San Diego Padres signed free agent 1B Allen Craig to a minor league contract and invited him to spring training. December 21, 2018 1B Allen Craig assigned to El Paso Chihuahuas. November 2, 2018 1B Allen Craig elected free agency. August 28, 2018 El Paso Chihuahuas activated 1B Allen Craig from the temporarily inactive list. August 22, 2018 El Paso Chihuahuas placed 1B Allen Craig on the temporarily inactive list. April 26, 2018 El Paso Chihuahuas activated 1B Allen Craig from the 7-day disabled list. April 20, 2018 El Paso Chihuahuas placed 1B Allen Craig on the 7-day disabled list retroactive to April 19, 2018. February 18, 2018 1B Allen Craig assigned to El Paso Chihuahuas. January 22, 2018 San Diego Padres signed free agent OF Allen Craig to a minor league contract and invited him to spring training. June 30, 2017 Pawtucket Red Sox released OF Allen Craig. January 18, 2017 Boston Red Sox invited non-roster 1B Allen Craig to spring training. August 14, 2016 Pawtucket Red Sox activated OF Allen Craig from the 7-day disabled list. August 4, 2016 Allen Craig assigned to Pawtucket Red Sox from Lowell Spinners. August 4, 2016 Pawtucket Red Sox activated LF Allen Craig from the 7-day disabled list. July 28, 2016 Pawtucket Red Sox sent LF Allen Craig on a rehab assignment to Lowell Spinners. July 28, 2016 sent LF Allen Craig on a rehab assignment to Lowell Spinners. May 24, 2016 Pawtucket Red Sox placed LF Allen Craig on the 7-day disabled list retroactive to May 20, 2016. May 16, 2016 Pawtucket Red Sox activated LF Allen Craig from the 7-day disabled list. April 14, 2016 Pawtucket Red Sox placed LF Allen Craig on the 7-day disabled list. January 13, 2016 Boston Red Sox invited non-roster 1B Allen Craig to spring training. November 6, 2015 Boston Red Sox sent LF Allen Craig outright to Pawtucket Red Sox. September 1, 2015 Boston Red Sox selected the contract of 1B Allen Craig from Pawtucket Red Sox. May 18, 2015 Boston Red Sox sent Allen Craig outright to Pawtucket Red Sox. May 10, 2015 Boston Red Sox optioned RF Allen Craig to Pawtucket Red Sox. August 21, 2014 Boston Red Sox recalled Allen Craig from Pawtucket Red Sox. August 18, 2014 Boston Red Sox sent OF Allen Craig on a rehab assignment to Pawtucket Red Sox. August 5, 2014 Boston Red Sox placed RF Allen Craig on the 15-day disabled list retroactive to August 2, 2014. Left foot sprain. August 1, 2014 Boston Red Sox activated RF Allen Craig. July 31, 2014 Boston Red Sox traded RHP John Lackey, LHP Corey Littrell and cash to St. Louis Cardinals for RF Allen Craig and RHP Joe Kelly. October 23, 2013 St. Louis Cardinals activated RF Allen Craig. October 3, 2013 St. Louis Cardinals reassigned 1B Allen Craig to the minor leagues. June 1, 2012 St. Louis Cardinals activated 1B Allen Craig from the 15-day disabled list. May 18, 2012 St. Louis Cardinals placed RF Allen Craig on the 15-day disabled list retroactive to May 17, 2012. Left hamstring strain. May 1, 2012 St. Louis Cardinals activated RF Allen Craig from the 15-day disabled list. April 26, 2012 sent LF Allen Craig on a rehab assignment to Memphis Redbirds. April 21, 2012 sent LF Allen Craig on a rehab assignment to Palm Beach Cardinals. April 1, 2012 St. Louis Cardinals placed LF Allen Craig on the 15-day disabled list retroactive to March 26, 2012. Recovering from November 2011 right knee surgery. August 10, 2011 St. Louis Cardinals activated LF Allen Craig from the 15-day disabled list. July 23, 2011 sent 2B Allen Craig on a rehab assignment to Memphis Redbirds. May 2, 2011 St. Louis Cardinals activated LF Allen Craig from the 15-day disabled list. April 29, 2011 sent LF Allen Craig on a rehab assignment to Springfield Cardinals. April 19, 2011 St. Louis Cardinals placed LF Allen Craig on the 15-day disabled list retroactive to April 17, 2011. Left groin strain. September 18, 2010 St. Louis Cardinals recalled Allen Craig from Memphis Redbirds. August 30, 2010 St. Louis Cardinals optioned Allen Craig to Memphis Redbirds. August 3, 2010 St. Louis Cardinals recalled Allen Craig from Memphis Redbirds. July 23, 2010 St. Louis Cardinals optioned Allen Craig to Memphis Redbirds. July 23, 2010 Allen Craig assigned to Memphis Redbirds. July 15, 2010 St. Louis Cardinals recalled Allen Craig from Memphis Redbirds. June 1, 2010 St. Louis Cardinals optioned Allen Craig to Memphis Redbirds. May 31, 2010 St. Louis Cardinals recalled Allen Craig from Memphis Redbirds. April 26, 2010 St. Louis Cardinals optioned Allen Craig to Memphis Redbirds. November 18, 2009 St. Louis Cardinals selected the contract of Allen Craig from Memphis Redbirds. July 7, 2009 Allen Craig roster status changed by Memphis Redbirds. June 26, 2009 Memphis Redbirds placed 1B Allen Craig on the 7-day disabled list retroactive to June 25, 2009. June 13, 2006 St. Louis Cardinals signed 3B Allen Craig.